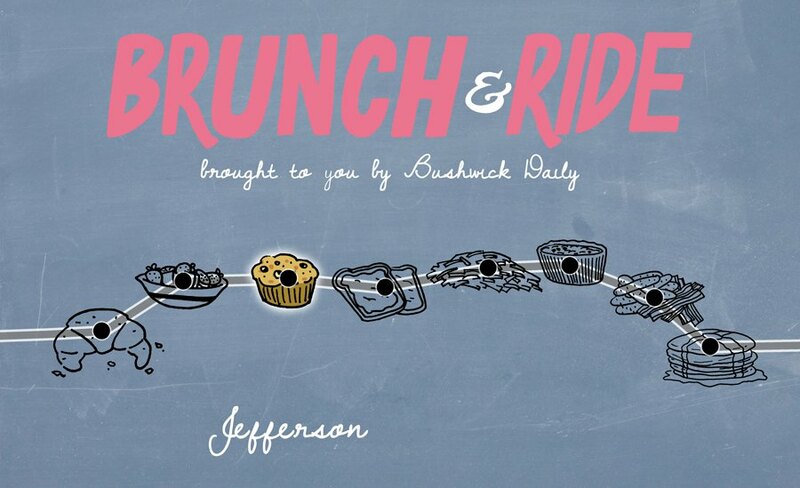 One stop further into Bushwick and the brunch spots keep getting better, thanks to neighborhood staples like Northeast Kingdom. An even better omen for the cuisine off the Jefferson stop is influx of new spots opening up and new menus debuting at your old standbys. 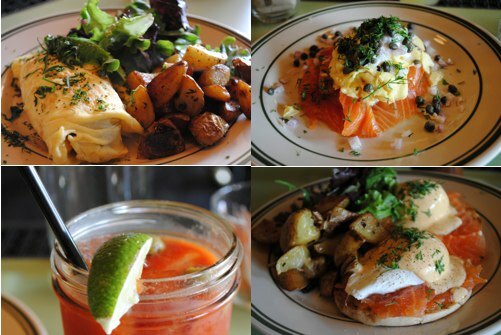 Start your weekend right by checking out five more spots willing to satisfy your brunch fix! Coming up on their one-year anniversary, the owners of Mazelle decided to make sure things their relationship with Bushwick stays fresh by importing a new “rock star” of a chef straight from San Francisco to liven up their already delicious food. 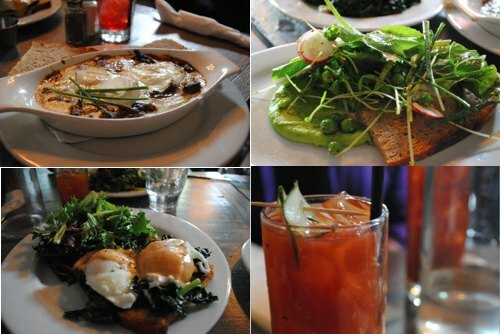 The result: A new brunch menu full of fresh, organic ingredients and house-made, Russian-influenced specialties. The space used to be a burrito joint, but Yury, the owner, transformed it from those humble origins into Mazelle's farmhouse-meets-factory aesthetic, adding intricately tiled floors, windows sourced from an antique glass shop, and cutout, back-lit panels (made by Yury) that stream pinpoints of light into the dining room. The focus on fresh, seasonal ingredients can be seen in dishes like the egg in a hole ($7), accompanied by shaved radishes and a fresh pea purée that tastes like spring. The Russian influence can be seen in dishes like the sweet lemon ricotta blintz or the baked eggs and beef gulyas ($12), a casserole-like dish made with organic beef that’s reminscent of beef stroganoff but adapted to your morning. Along with a kale caesar ($10) that’s perfect for sharing (and pretending you’re starting your morning healthfully), there’s the kale benedict ($10) topped with a rich brown butter hollandaise that’s decadent enough to please Queen Catherine in the morning. Ideal Meal: Start with the fresh-as-spring egg in the hole with fresh pea purée to whet your appetite. Then, move on to the kale benedict. Bringing a taste of France to Bushwick (and providing an alternative to the many new Southern-influenced joints), Mominette offers classic brunch fare with a Parisian twist in a warm, neighborhood setting. Stepping through the scalloped glass of the front door, you’ll find a vintage turntable and stacks of records ready to play jazz. While this might be out of place in typical (aka stuffy) French restaurants, it matches Mominette’s quirky yet simple decor, seen in the old-timey clock on the wall, vintage chandeliers, newsprint wallpaper and rooster plate perching above the bar. Playing up the French countryside café vibe is a menu of “les oeufs” and “les plats,” letting you dine on eggs done in many styles (Benedict, fried, omelets, or in steak and eggs), or distinctly French dishes like duck hash confit ($15) or a Croque Monsieur ($10). 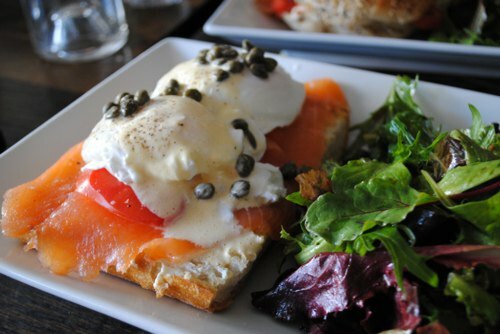 For a savory and satisfying start, try the Salmon Gravlax ($12), in which fluffy scrambled eggs and salty capers top salty smoked salmon with a sprinkling of dill helping the flavors meld together. Two perfectly poached eggs sit upon a toasted English muffin, all covered in a tangy hollandaise and accompanied by crispy country-style potatoes in the Eggs Norwegian ($11), another dish made with their fantastic smoked salmon. There are also some sweet selections, like French Toast ($9) or buttermilk pancakes ($9), but the Nutella and banana crepes ($12) are the way to go when you need to satisfy your sweet tooth. Ideal Meal: Try the fluffy eggs in the Salmon Gravlax if you’re craving something salty or the Nutella and banana crepes when you want to start your morning with something sweet. The bright and cheery vibe at this laid back, neighborhood bar lets you start the morning in a good mood, even if you’re nursing a hangover from the previous night’s festivities. With vintage trappings, decorative glass and a wall taken up by ceramic garden mural, the space is open yet still homey, with small groups of locals stopping in to rehash last night’s shenanigans with friends, or the warm and friendly staff. If all of the tables are taken (which is a distinct possibility), side up to the bar where one of the enthusiastic, plaid-clad bartenders can provide something delicious and strong to take the edge off, like a Michelada ($8) or a Bloody Mary in classic ($8), spicy ($10) or garden ($10) in pint glass servings. The pickled-veggie-topped Garden Bloody Mary features their famed beet-infused vodka which helps deepen the rich flavors of the tomato juice. While they’re working on offering more vegan and vegetarian options, eggs are the star of the brunch show, featured in dishes like the chilaquiles with scrambled eggs and salsa verde ($9), baked eggs in “purgatory” ($9), and a frittata packed with seasonal veggies ($9). 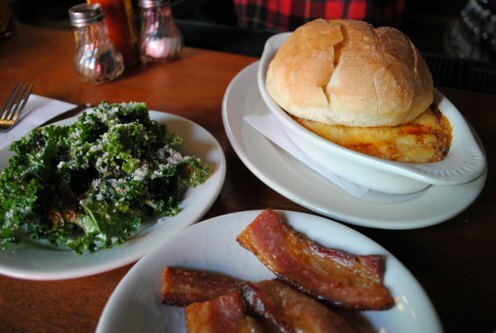 Don’t forget about sides ($3), like creamy cheese grits, so-good-it-can’t-be-healthy kale salad, flaky biscuits and thick-cut bacon (tip: ask the bartender for some maple syrup for dipping). And if you can’t move after stuffing yourself to the gills, it’s perfectly acceptable to spend the day nursing a Dark and Stormy ($9) at the bar. Ideal Meal: A Garden Bloody Mary to take the edge off, followed by the Eggs Purgatory, a cheesy casserole-like dish of eggs, tomatoes and parmesan. If you have room, add kale salad and bacon on the side. Understanding that indulging in brunch only on the weekends seems preposterous, the folks at Café Ghia make sure their brunch menu is available seven days a week (with the exception of a few dishes) – a perfect situation for the many laptop-wielding patrons of this local corner spot. Grab a book or work on your novel at the bar or in front of the full windows that let the sun stream in to light the bar’s brick walls and wood accents. A newly hired chef has updated the new spring/summer menu, increasing the use of seasonal veggies and adding more vegan and vegetarian options, while still offering enough eggs and bacon to satisfy brunch traditionalists. A number of simple egg dishes (seasonal omelets, baked eggs in tomato sauce, and fried eggs) accompany favorites like the $10 Lumberjack Stack (eggs and bacon sandwiched between waffles) or the Ranchero Benedict ($13) which takes two corn griddles cakes and tops them with avocado, poached eggs, and Huancaina sauce, a tangy blend of yellow pepper and feta that provides a nice kick of flavor. The Vegan Scramble ($10) replaces eggs with tofu, adding in sweet potato, kale, scallion, spicy black bean sauce and ginger-lime tofu cream. As for drinks, you can clear your sinuses with booze-infused concoctions like the spicy Kimchi Bloody Mary ($9) or wake up with a Blonde Irish Coffee ($8), an ode to Ireland that adds Jameson and Bailey’s to your java. Known at nights as a Spanish wine bar, the Bodega transforms into a bagel-and-egg slinging joint on weekends, packing the small tables with Bushwickians eager to cure their morning hunger pains. Stepping into the small space, you'll instantly be overwhelmed with the smell of bread toasting, bacon frying, and eggs cooking, courtesy of one cook manning the small grill at the corner of the bar. Bellinis ($5) are a new addition to the drink menu, along with a spicy-salt rimmed Michelada ($4) or the Bloody Geisha, a take on the traditional Bloody Mary using Soju. While typical nibbles at the Bodega are Spanish-inspired, the brunch menu is fairly standard, featuring a surprisingly good toasted bagel and specialties like the Eggs Bodega ($10), a slab of crusty bread slathered with cream cheese and topped with poached eggs, roasted tomatoes, capers and gravlax for a salty Spanish take on the New York institution known as a bagel and lox sandwich. There’s also a number of more unique brunch options, like the Green Eggs and Jam, poached eggs on Texas toast with blue cheese butter sauce and balsamic-tomato jam ($9), or the Oyster Mushroom Hash, sautéed mushrooms, shallots and rosemary topped with poached eggs and hollandaise ($10). Get there early though, since the small production and even smaller space means that certain dishes sell out fast. 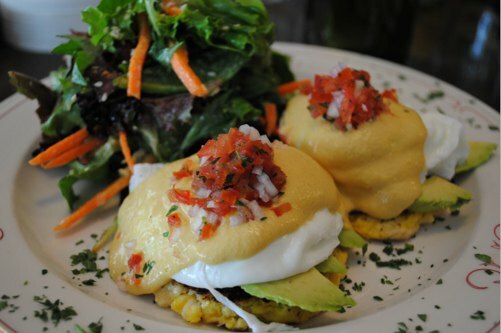 Ideal Meal: Start with a Michelada, followed by the Eggs Bodega for a well-rounded morning meal.